Posted on Friday, November 30th, 2018 at 10:03 am. Old world charm meets modern day living! These downtown apartments are stunning. Located above the old Muzio’s store, they are iconic San Luis Obispo. They have been completely remodeled to include new kitchens with quartz countertops, bathrooms with subway tile, double hung windows, skylights, heating and air conditioning, electrical and plumbing, but have left the charm of the original apartments including flooring (solid oak and douglas fir), plaster walls with original molding, high baseboards, window wells, some original woodwork built-ins. There is laundry on the premises (included) and other utilities are included. 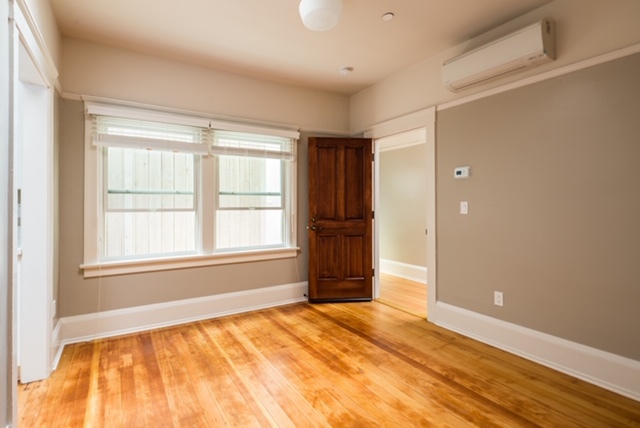 This large studio is an end unit and has a walk-in closet, with a fold-up dining table. Contact us for a tour today!